Our Christmas Cards and General Greeting Cards will help you wish your customers, friends and relatives the warmest of greetings! 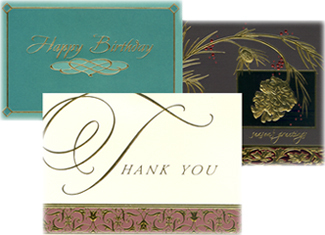 View our large selection of all occasion cards and new line of business thank you cards. All of our greeting cards reflect a 20% discount. To see our selection of holiday and all occasion greeting cards, start by browsing our holiday card collection.